Where Are Your Favorite Websites Hosted? We have spoken in this space previously about the value of considering the geographic location of datacenters prior to choosing a webhost. In fact, the purveyors of many of the world’s most important and frequently visited websites consider this amongst the most significant key elements in settling on a location to host their data. 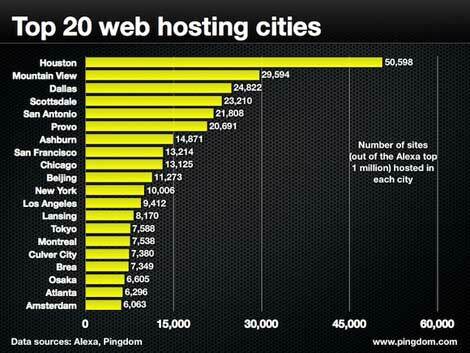 In a recent study by Pingdom on the top 20 web hosting cities, the cities that house both our US Central (Lansing, MI at number 13) and US West (Scottsdale, AZ at number 4) locations were revealed to host over three percent of the world’s most visited websites. This study by Pingdom represents a significant finding for those looking for the safest, most efficient and reliable place to host their enterprise. With factors to take into consideration considering network availability, weather, end-user location, latency and geographic redundancy, our two major US hubs have proven to be atop the most popular amongst the world’s most illustrious data purveyors — many of whom, we are currently proud to be hosting!